MrTickTock 3.1 has just been released and published at http://mrticktock.com. 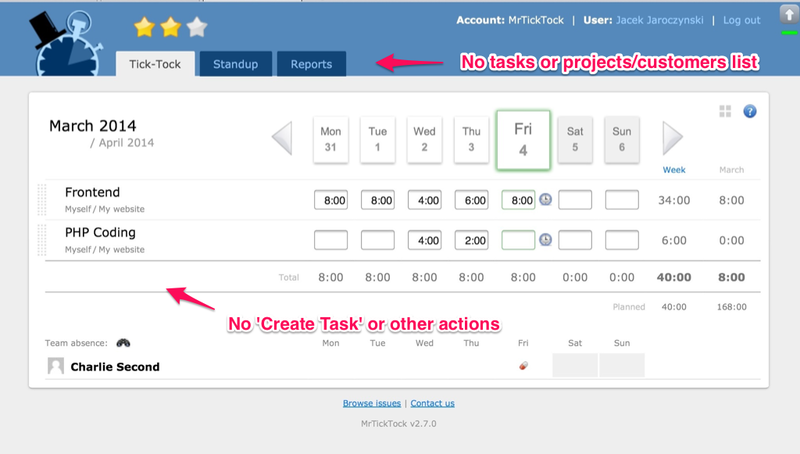 Daily view on Tick-Tock page allows to filter tasks. That is a very handy feature if you work on a number of items. Now you can use down/up keyboard arrows to move the caret not only between time input fields but also to the task filtering field. Feature carousel, support page and other minor changes appeared on our website. We have also fixed some issues and added UX and performance improvements for the most frequent actions. In next version we will again focus on UX and bugs. MrTickTock 3.0 has just been released and published at http://mrticktock.com. Our absence tracking model evolved for the last months and API needed to be refreshed. Due to compatibility reasons we decided to leave current who_is_off endpoint without a change and add new who_is_off_v2 to reflect the actual model. See more here. That is quite common that people are providing invalid email addresses during sign-up if they only want to quickly test the service. We want to avoid MrTickTock sending messages to not existing email addresses so every new account will be required to confirm the email address in order to enable notifications. The same applies to everyone who changes email address in the profile. Email addresses of existing users and users accepting company invitation will be automatically marked as confirmed for obvious reasons. That will allow new users to make the first steps more smoothly. After around six months long experiment with "Evernote" like business model when we have been charging only for Premium account/features, we would like to try traditional approach. Since now we are offering the service for free to individuals and groups up to 4 active users. We will charge $3 for every user above that limit. Unfortunately we did not gather enough money to sponsor the development of the product without investing more money from our side (what we would like to avoid long term). If you are an active MrTickTock user and you like the service and number of users actively using the service in your company if grater than 4 then please subscribe and praise our work with some dollars. If you represent a bigger company with tens of users and think that the service is too expensive then please let us know. We might offer you a discount. In next version we are going to add more UX improvements to make the service more user friendly and easy to use. MrTickTock 2.9 has just been released and published at http://mrticktock.com. 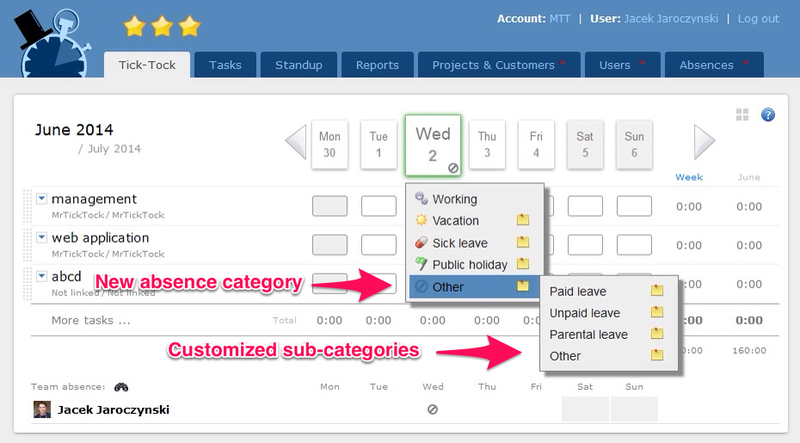 There is a new "Other" category which contains list of customized absence sub-categories. The initial set of the items is: "Paid leave", "Unpaid leave", "Parental leave", "Other" and can be configured from the company Settings page. We have added new Absences tab containing list of awaiting time off requests. Admin can accept or reject any request. Only "Vacation" and "Other" categories require approval ("Sick leave" and "Public holiday" categories do not). Awaiting requests are marked with grey icon across the service (Tick-Tock page, calendar, etc.). Time off approval feature is enabled by default and can be disabled from the company Settings page (making the Absences tab invisible). As usually this release contains bunch of bug fixes and improvements. In next versions we are going to add several minor improvements to make the service more user friendly and easy to use. MrTickTock 2.8 has just been released and published at http://mrticktock.com. Number of actions that restricted users can perform is limited to the absolute minimum. Restricted user role is a great solution for external contractors who should work only on assigned tasks and do not see other details like list of projects and customers. 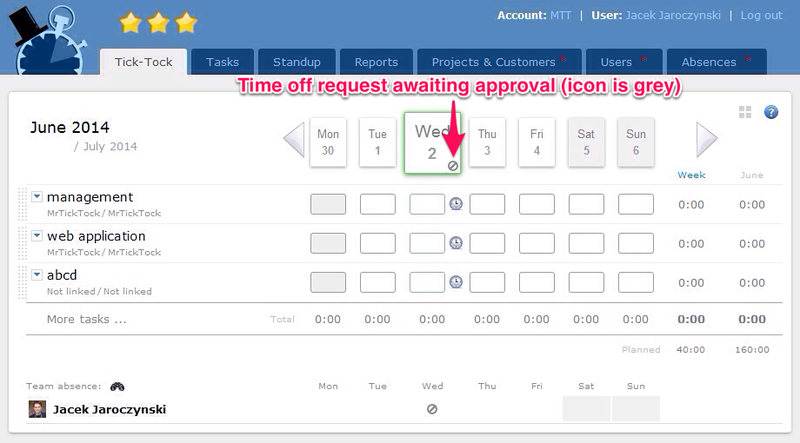 Report time only for assigned tasks (admin is responsible for adding tasks to Tick-Tock view of this user). Add standup notes to assigned tasks. See standup notes related to assigned task and its project. See assigned task details (e.g. list of other users working on the same task). 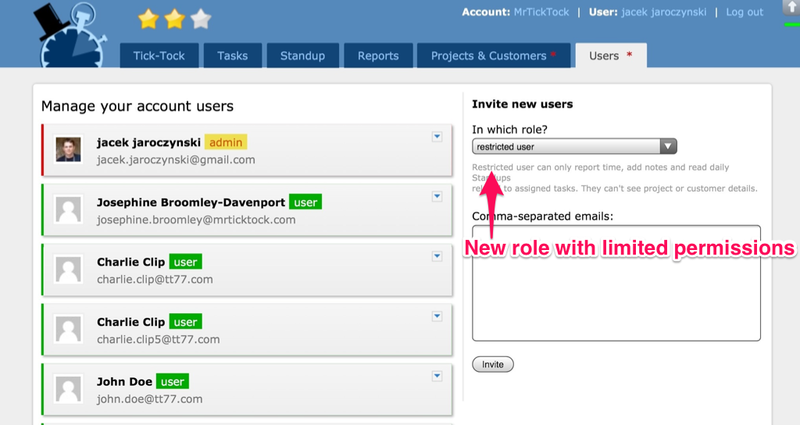 Add tasks to Tick-Tock view. Perform any task action (hide, close, reopen, create, etc.). See Standup reports for other projects and customers. See list of projects or customers. See projects or customers details. The rationale behind this move is that editing settings of another user is a natural extension of editing timesheet of another user which is already a Premium feature. We have combined them together in order to make the service and our Premium vs Free approach more clear. It was supposed to be Premium feature from the beginning as described here. Try all of that at mrticktock.com and follow us on Twitter if you haven't already. MrTickTock 2.7 has just been released and published at http://mrticktock.com. We have added "Public holiday" option to the list of absence types as requested by our customers. Selecting this option reduces planned workload (number of hours planned for a day, week, month and year) so it works in the same way as "Non-working" option. 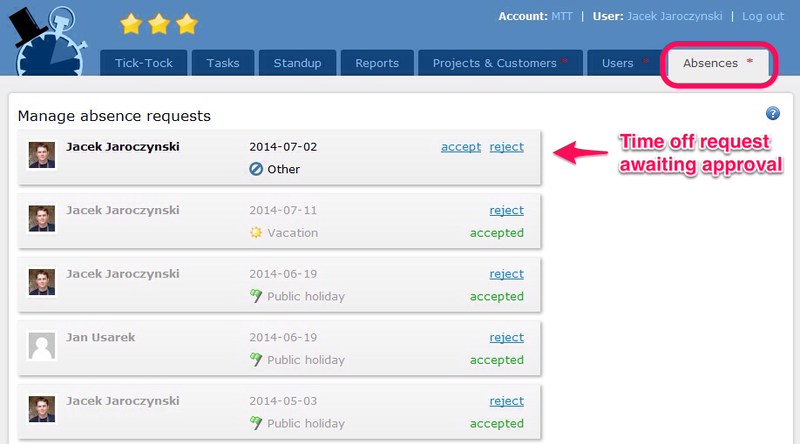 "Public holiday" option is available in various places of the service (reports, user details, etc.). It was a common problem in our company that people were sometimes late and reported time for the past month or a period we considered closed (in terms of expenses, etc.). The obvious solution to this problem is to close time reporting possibility for such period. It is now possible from the company Settings page or generated report page. This feature will become Premium since next version. As usually this release contains bug fixes and improvements. Since next version (2.8), editing settings of another user will become a Premium feature. The rationale behind this move is that editing settings of another user is a natural extension of editing timesheet of another user which is already a Premium feature. We want to combine them together and make the service and our Premium vs Free approach more clear. That's all for today friends. Try all of that at mrticktock.com. 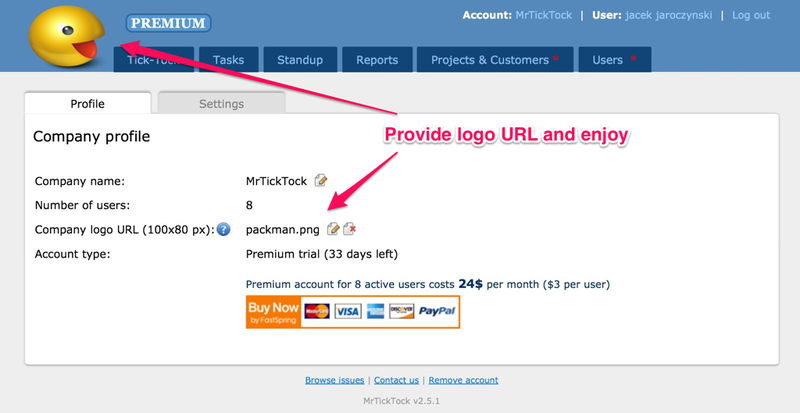 MrTickTock 2.6 has just been released and published at http://mrticktock.com. This version brings small but exciting logo branding feature and allows to subscribe to Premium plan. Now you can change the standard MrTickTock logo to the custom one. Simply go to company profile and provide your url which points to the image (we do not host it on our servers). Please note that logo will be scaled to 100x80 pixels so the best is to provide an image of this size or similar proportions. Finally it is possible to subscribe to our Premium account (we have chosen FastSpring based in Santa Barbara, CA as the payment operator). As usually we have fixed some some bugs and improved few things to make UX more smooth. 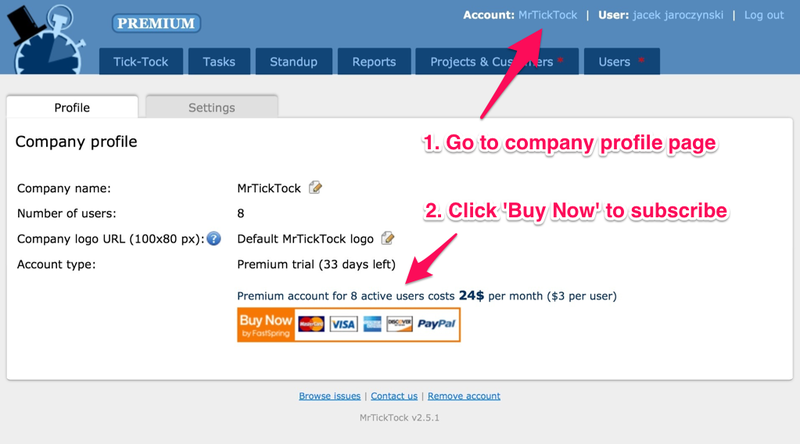 MrTickTock offers two plans: Free and Premium. Free plan is available for everyone and is not limited by the number of users, projects or tasks. It is fully functional but simply does not offer Premium features. Premium plan offers additional features listed below. It costs $3 per user within company account (we do not charge for blocked/dismissed users) per month. Every account starts with 30 days of free Premium plan. After 30 days Premium account is converted into Free account (premium features become disabled) unless customer decides to subscribe to Premium plan. What are the Premium features? select tasks for user to work on, etc. edit task name and description. 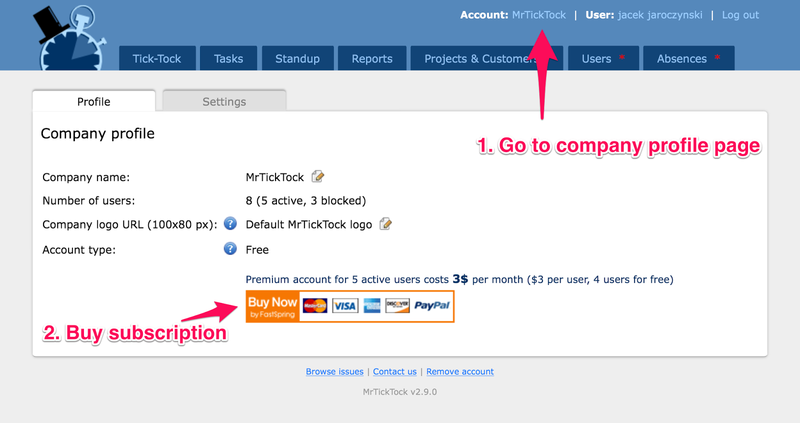 It is possible to change the standard MrTickTock logo to the custom one (from the company profile page). 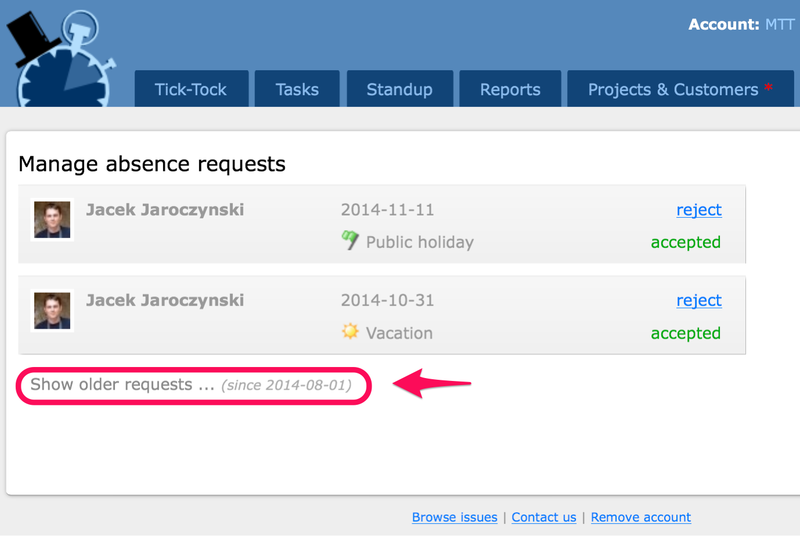 As requested by our customers we will add possibility to approve or deny time off requests. Absence types might depend on the company policy and country. 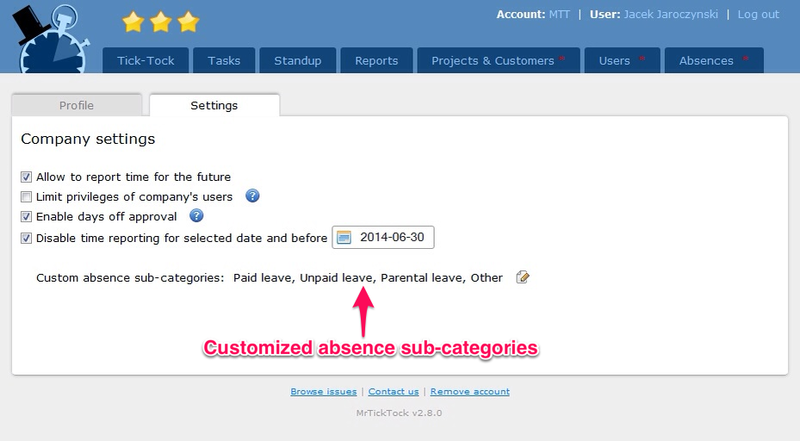 This feature will allow to customize absence categories. In order to summarize month, bill customers and avoid mistakes we will introduce possibility to disable time reporting capability for a given date and before. 30 days of trial period? All new and existing accounts start with 30 days of trial period. All Premium features are enabled in that time and become disabled when trial ends (unless the subscription happens). 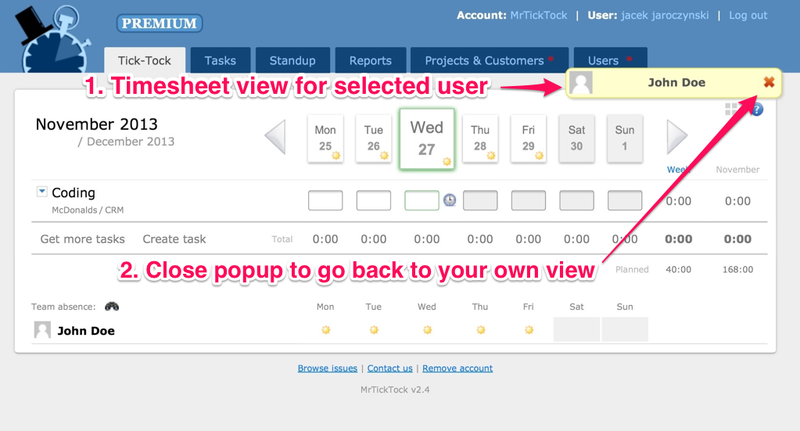 Please note that above means that MrTickTock account stays fully usable and users can still report time and mark days off, managers can create reports and so on. Our Free account is fully functional. There is absolutely no data loss and no data access loss. You can find few more details about Premium plan and full list of features on the pricing page. "Your Premium trial will expire in 30 days"
This message is presented to all existing customers when they first log in to version 2.6. This message is also presented to all new users when they log in first time at all. You can expect similar message few days before trial ends and next one right after account loses its Premium status and becomes a Free one. These messages are pretty and not annoying. They are presented as a small yellow popup which can be closed in a natural way with just one click. How to subscribe to Premium plan? That is simple. Just go to your company Profile page, check the price (it depends on the number of active users, we charge $3 per active user) and click the orange "Buy Now" button. The subscription payment is managed and processed by FastSpring based in Santa Barbara, CA. We would like to thank to all of our existing customers who helped us understand the business better and helped us drive the service with their helpful feedback. We hope that you will like our Premium features and decide to subscribe. They are really useful for teams. feedback system and follow us on Twitter if you haven't already.